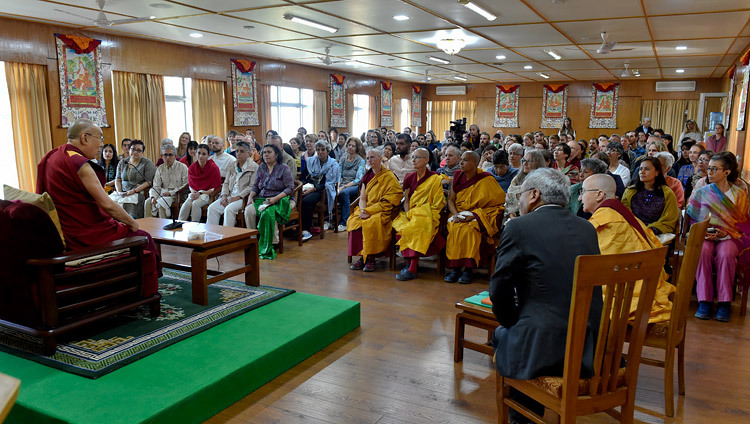 March 30, 2018, Thekchen Chöling, Dharamsala, HP, India – “Brothers and sisters, I’m happy to meet with all of you,” was how His Holiness the Dalai Lama welcomed almost 150 people from many different parts of the world at his residence this morning. Nearly 50, predominantly from Mexico, Colombia, Argentina and Chile were led by a group of four Buddhist nuns who have set up a small community in Mexico. Another group of about 90 were participants in a ten day course introducing Tibetan Buddhism at the local Tushita Meditation Centre. 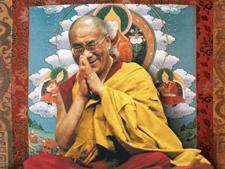 “We 7 billion human beings on this planet are all the same—mentally, physical and emotionally,” he told them. “We were all born from a mother and we all survived because of her kindness and care. As human beings we are social animals and it’s love and affection that binds us together. “These days scientists have conducted experiments with infants who are still too young to talk and conclude the evidence suggests that basic human nature is compassionate. Other findings suggest that living in constant anger and hatred undermines our immune system, whereas cultivating a more compassionate attitude in general strengthens our physical and mental well-being. His Holiness observed that despite substantial development in many areas, in today’s world the conflicts we see breaking out in the name of religion and the thriving trade in weapons, which are simply instruments for killing, betrays a fundamental lack of moral principles. Under such circumstances, each and every one of us, as part of the world’s human population, has a responsibility to contribute to making the world a happier, more peaceful place. In answering questions from the audience, His Holiness expressed his deep admiration for all the world’s major religious traditions. He distinguished between those, like Buddhism, that teach the importance of karma, taking responsibility for your own actions, and the many others that emphasize the importance of faith in a creator god. He described seeing our human brothers and sisters as all creations of that one god as a wonderful and powerful instruction. With regard to Buddhism, he observed that once the Buddha had left home and begun to engage in spiritual practice he drew on existing traditions of ethics, tranquillity and insight. These gave rise to a profound understanding of the workings of the mind and emotions in the context of a clear comprehension of reality—an appreciation that nothing exists as it appears. His Holiness stressed that those who wish to follow the Buddha today should aspire to be 21st century Buddhists, their practice based not just on faith alone, but rooted in knowledge and understanding. Asked his response to growing nationalism in many places, His Holiness remarked that common sense tells us we all have to live together on this planet. The global economy is not constrained by national boundaries. Climate change is a serious threat that concerns all humanity. Faced with a need to take a broader perspective, adopting a nationalistic view seems unrealistic, short-sighted and out of date. Finally, His Holiness was requested to give a transmission of the ‘Eight Verses for Training the Mind’, which he did, reciting it briskly from memory in Tibetan. He praised the advice this short text conveys about altruism, noting that the final verse refers to the wisdom understanding emptiness. He recommended that those interested should read another book that he has personally found of great value—Shantideva’s ‘Guide to the Bodhisattva’s Way of Life’—paying particular attention to the sixth and eighth chapters that deal with the cultivation of patience and compassion.